If you’re lucky enough to have fruit trees on your property, you should know how to properly care for them. If you’re lucky enough to have fruit trees on your property, you should know how to properly care for them. As much as you hate waiting, waiting until it’s time to harvest is usually your best bet. Sometimes, however, you will need to pick the fruit a bit sooner. Picking fruit at the right time can keep your fruit trees happy and healthy for many years! Most fruit trees don’t start producing edible fruit until they are around three to five years old. They need time to mature. Any fruit that is produced in this time should be harvested as soon as you see it so the tree can focus as much energy as possible into growing and maturing. While some arborists disagree on this procedure, you ultimately just need to do your research and do whatever you think is best for your trees. Sometimes, fruit can get damaged. The damaged fruit can attract birds and insects, which will eat other fruit on the tree regardless of whether it is damaged or not. Once birds and insects are aware that your fruit trees are producing, they tend to go from piece to piece eating little bits of each one. It can be next to impossible to get them away once they’re there! Be sure to clear away any damaged fruit that falls off the trees as well. When you see lots and lots of fruits growing on your trees, you probably get excited that it’s doing so well. However, your fruit trees sometimes need thinning. 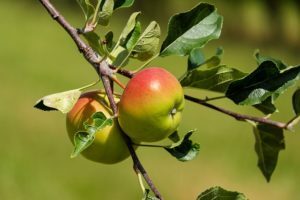 For example, if a tree will produce 100 pounds of apples over a growing season, you will want to thin out the amount of fruit on the tree so that you will get larger apples. This entry was posted on Friday, July 6th, 2018 at 4:13 pm. Both comments and pings are currently closed.